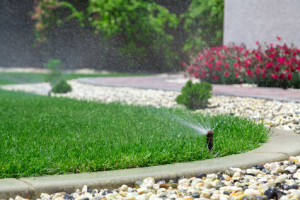 Although watering restrictions for many cities have been adjusted from once every two weeks to once a week, it is still very important to keep water conservation on your mind. Below is a list of ways to conserve water on your property. For additional information, please see the Water Conservation section of our Tips page. Run the sprinkler system during the early morning hours. Program the controller so that it waters in three to four short cycles rather than a single long cycle. Give the sprinkler system a tune-up. Make sure tall grass, ground covers or shrubs are not blocking or deflecting the water spraying out of the sprinkler heads. Relocate sprinkler heads so that they are between four to six inches from the edge of sidewalks, curbs, driveways, patios, etc. Install a rain and freeze sensor. Switch to drip irrigation for watering shrubs, flowerbeds and foundations. Mow the grass at a higher length. Use mulch in the shrub beds. Once-a-week watering is back! At the end of August, the North Texas Municipal Water District (NTMWD) announced that they would allow for residents of plano to water once a week. This change was implemented September 1st and has been permitted for the months of September and October. Despite lake levels being low, more frequent watering has been allowed to maintain water quality. The Texas Commission on Environmental Quality (TCEQ) requires that water providers maintain chlorine residuals in transmission and distribution systems so that the treated water supply is safe to use. Annually, chlorine residuals are depleted by increases in temperatures during summer months. According to the NTMWD, during the summer of 2014, consumers have reduced their water usage so well that maintaining chlorine residuals has been compounded by decreased demands. To maintain water quality, municipalities perform flushing of hydrants to remove the water that has decreased chlorine residuals. To improve the circulation and increase the water flow within the water systems, allowance of once per week watering with sprinkler systems will assist in maintaining the required chlorine residuals.